Automatic machine for the assembly of mops made of cotton, non-woven or synthetic material (spun-lace). OCTOPUS 2 PLUS is an easy to operate machines for manufacturing mops of various sizes and shapes. 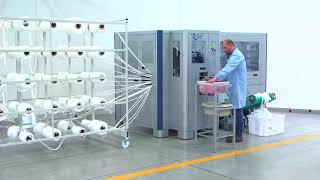 OCTOPUS 2 PLUS can process cotton yarns, spun-lace and non-woven material spools and use them to assemble mops with plastic sockets and staples. Once assembled, the mop is pulled towards the cutting and unloading area. OCTOPUS 2 PLUS is fed with sockets and staples by conveyor belts, ensuring higher output. and giving more time to the operator. The conveyor belt feeders can be removed, in order to let the machine operate in manual mode for the manufacturing of special items, such as mops with metal sockets and staples. Spool rack (optional) available to hold up to 60 cotton spools destined to feed the machine. BTP 800 slitting unit (optional) available to cut non-woven material spools and feed the machine with non-woven strips. The finished products can be unloaded by conveyor belt (optional).